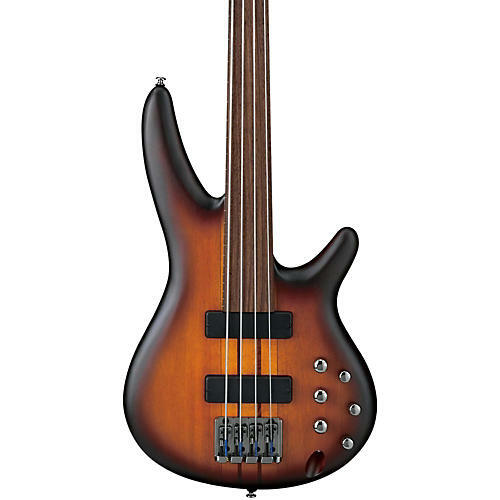 Over 25 years ago, the SR established Ibanez as the leader in innovative bass building. Throughout the years, Ibanez made fretless versions of this classic for a limited number of esteemed Ibanez artists. Now, the Ibanez Bass Workshop makes this much sought after option available to SR players everywhere with the introduction of the SR Portamento. The SR Portamento offers a rosewood fingerboard that extends the length of the standard SR neck to a hefty 30-fret length. Several years in the making, the SR Portamento's new AeroSilk piezo system delivers an uncanny touch of hollow-bodied openness, and realizes the innovative Upright Double Bass sound to blend into the mix that both inspires and redefines the role of the solid body bass. The SR Portamento features 5-piece Maple/ Bubinga thru-neck for increased sustain and superior tone. The EQ section incorporates the controls of the Bartolini pickups with the AeroSilk Piezo system. Controls include a neck volume, bridge volume and bass & treble controls for the Bartolini MK-1 pickups and a Master volume and a tone control for the Piezo system.